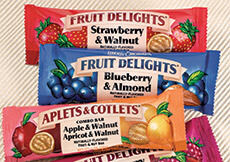 Individually-wrapped pieces of our most popular candies! 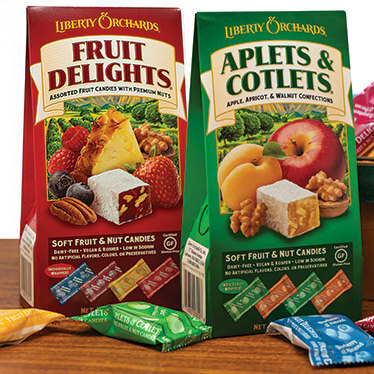 For those times when you'd like to tuck away just a bite or two of our fruit-and-nut favorites, we now offer convenient individually-wrapped pieces you can take anywhere! 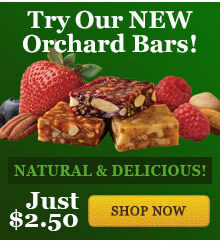 Flavors include Aplets & Cotlets (Apple & Walnut and Apricot & Walnut), Fruit Delights (Strawberry & Walnut, Blueberry & Almond, Raspberry & Pecan and Pineapple & Macadamia) or Tropical Delights (Passion-Orange Delight, Mango & Macadamia and Pineapple & Macadamia) Each box contains ten pieces and is sold in 3-box packs (thirty pieces total). 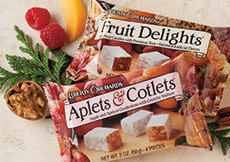 Choose from Apple & Apricot, Assorted Fruits, Tropical Fruits, or the Assorted Flavors Trio Pack that includes all three boxes. Kosher. These candies are great! I've order a few times and they are so good and I have really enjoyed them..